You'll regain control after the trial locked in prison, with your only company a save point and some Ethers if the outcome of the trial was positive. 1.2 Option 2: Prison break! 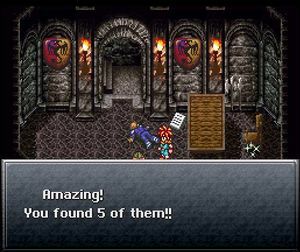 Depending on the outcome of the trial, the dialogue will indicate a different sentence for Crono. For example, the best outcome says that he will serve three days in solitary confinement. 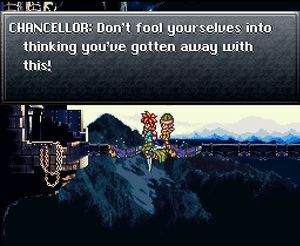 However, once the Chancellor escorts Crono to prison, he circumvents the court and changes Crono's sentence to a death sentence. Option 1: wait out the three days until your execution. It'll take about one minute of real time. Lucca will show up to rescue you and knock all of the guards out. You'll be able to start exploring much farther into the dungeon and all the guards will be knocked out, plus Lucca will be in your party. Choose this option if you are minimizing your character levels (there is only one mandatory fight before the save point) and want to reach the upcoming secret. Option 2: Rattle the gate three times, and knock the guard out when he comes to beat you up (or if you want a harder fight, charge out of the cell.) You'll have more enemies to fight. 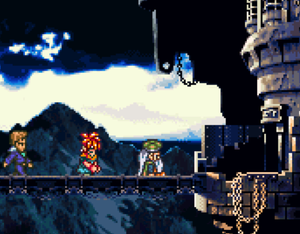 If you wait until Crono's execution, Crono will be led to a guillotine before Lucca bursts in and knocks out all of the guards. Grab the BronzeMailBronzeMailBronze ArmorBronze ArmorBronze ArmorBronze Armor from the chest, then walk down and grab the Mid TonicMid TonicMid-PotionMid-PotionMid-PotionMid-Potion from the chest on the left. Then speak to Fritz to free him from the guillotine on the right. Walk down through the gate and notice that the guard is knocked out. Interact with the body to get a Mid TonicMid TonicMid-PotionMid-PotionMid-PotionMid-Potion. At the fork, take the upper path. Run to the far left and interact with the other body to get another Mid TonicMid TonicMid-PotionMid-PotionMid-PotionMid-Potion. Head up the stairs and across the walkway. At the four stairs, kill the Blue Shields (22XP). Take the top left exit. Run to the far left to the open cell, then up and through the hole in the wall. Outside the castle, run to the right, then climb down until you reach a platform. Walk to the gap between the platforms, then continue down. On this third platform, run to the left, then climb down to the final platform with the hole in the wall. Go inside to reach a locked cell you can't reach any other way. There is another Shelter waiting for you here. Walk over to the left and interact with the black hole in the floor to automatically climb down into another cell below. Here you will gain a Lode SwordLode SwordSilver SwordSilver SwordSilver SwordSilver Sword and 1500 G. Make sure to equip it. Interact with the wall where you came down to climb back up. Head all the way back up the castle to the stairway where you fought the Blue Shields. Do not fight the Blue Shields again. Instead, take the top right exit to reach the save point. Assuming you'll take the long way by breaking out yourself for now, fight the other guard and use the cup in your cell if you need to restore your health. Take the gift on the bed for some Ethers (how many you receive depends on how you did in the trial). Head straight to the east (lower stairs) and across a bridge to find a single guard guarding a cell. Knock him out from behind and open the chests inside for 2x Ether and 2x Mid TonicMid TonicMid-PotionMid-PotionMid-PotionMid-Potion. An Omnicrone will fight you afterwards. Head back to the room with the Blue Shields (make sure you wait until they turn to one side before attacking. Also note that this is the only place in the game where they can be encountered, and this dungeon is no longer accessible after this part of the story. If you are minimizing your levels to get Frog Spekkio later, it is safe to defeat these Blue Shields once). The upper left exit contains a fight with the undead and a preview of what's to come, so go to the upper right. Search this guy for a whopping 5 Mid Tonics. Fight the guards on the bridge, and try to sneak past the guards and knock them out for some Mid Tonics. You can find another Mid TonicMid TonicMid-PotionMid-PotionMid-PotionMid-Potion in the chest in the room where Fritz is. Knock out the three guards (wait until they look away and then go up near them and interact with them; Crono will hit them once and they will fall over without having to be fought), then interact with their bodies for three Mid TonicMid TonicMid-PotionMid-PotionMid-PotionMid-Potions. Open the gate (go through the gate behind Fritz to find a BronzeMailBronzeMailBronze ArmorBronze ArmorBronze ArmorBronze Armor) and make sure you free Fritz from the guillotine. Incidentally, if you chose to let Lucca break you out, this is the point where you'll start. If you had Lucca help you, then two guards are knocked out already, so just collect two Mid TonicMid TonicMid-PotionMid-PotionMid-PotionMid-Potion from their bodies and attack the last guard for the last Mid TonicMid TonicMid-PotionMid-PotionMid-PotionMid-Potion. If you reenter the room, then you can repeat this again to get as many Mid TonicMid TonicMid-PotionMid-PotionMid-PotionMid-Potions as you want. Head out the northwest exit and go across the walkway. You'll come to another set of four stairways. The bottom left stairway will offer a Shelter (so ignore it), and the top left stairway will lead to some good rewards so go there. Run to the far left to the open cell, then up and through the hole in the wall. Outside the castle, run to the right, then climb down until you reach a platform. Walk to the gap between the platforms, then continue down. On this third platform, run to the left, then climb down to the final platform with the hole in the wall. Go inside to reach a locked cell you can't reach any other way. There is another Shelter waiting for you here. Walk over to the left and interact with the black hole in the floor to automatically climb down into another cell below. Here you will gain a Lode SwordLode SwordSilver SwordSilver SwordSilver SwordSilver Sword and 1500 G. Make sure to equip it. Interact with the wall where you came down to climb back up. Head all the way back up the castle to the stairway where you fought the Blue Shields. Now take the top right stairway and follow it up to the light. Now you'll be out of the dungeon and back in the grey walls of Guardia Castle. If you took option 2, you will have to fight a couple guards, then Lucca will show up to knock out a guard if she didn't join you already. Search his body for 5 Mid TonicMid TonicMid-PotionMid-PotionMid-PotionMid-Potion. The paper on the ground will give you some hints for the boss, but see below for even more details. At the save point, use a shelter if damaged, save your game, then get ready to face a boss: the Dragon Tank. Head repairs damage: heals about 75 to all parts of the Dragon Tank. Dragonfire (Fire): A fire breath attack that does about 20-30 fire damage to one person. Missiles: A missile attack that does about 15 physical damage to one person. Laser (Lightning): A laser attack that does about 25 damage to one person. Sometimes used as a counter-attack. Energy is stored in the wheels: this means that the tank is about to ram you. 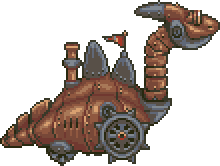 Dragon Charge: a ramming attack used after Energy is stored in the wheels that deals about 40 damage to everyone. The Dragon Tank contains three parts: head, body and wheels. Each behaves like a normal enemy, although they only do certain things. For instance: the head can heal all three parts or breathe fire. The head has the most HP and is immune to lightning and fire damage, so you won't be able to use Lucca's techs or Dual Techs on it. The body contains the engine, so once it gets destroyed the entire machine falls. It can fire missiles or lasers. Finally, the wheels can store up energy and then release it by ramming Crono and Lucca doing around 40 damage (always make sure Lucca is healed enough to survive this attack; at level 6 with Maiden's Suit she usually takes ~31-39 damage). You'll need to kill the head first to stop it from constantly healing the wheels and body, then concentrate on defeating both the wheels and body at the same time. Have Crono use his normal attack on the head until it dies (if you use techs that hit multiple targets, the body and wheels will heal and you will run out of TP trying). Have Lucca heal the two with potions and then Mid-Potions. After the head is destroyed, use Fire Whirl so that you won't have to worry about concentrating on a single part. Simply use Fire Whirl a few times, maybe three and the fight will be over. This can be a tough fight at low levels, so try to use those Mid Tonics you picked up and keep your hp above 30. 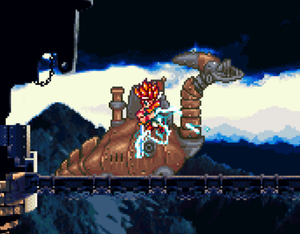 Once defeated you'll watch a small cutscene as Crono leaps upon the Dragon Tank and stabs his sword down into it, destroying it. The Chancellor holding on for dear life. After the boss fight, the chancellor will come with two men trying to fix the Tank, but it's too late. The Dragon Tank explodes, destroying part of the bridge underneath the men. The chancellor with his two men fall and quickly climb onto each other to act as a bridge, trying not to fall through the gap. You can now walk over them. You're now in the Guardia Castle and out of the prison. On the first landing there is a Shelter. Once you reach the Main Hall you'll be chased to the exit of the castle by soldiers. When you reach the exit you will be surrounded and a cutscene will start. Marle will fight with her father, the King, before joining you to leave her home. The party continues to be chased by guards and ends up trapped in a corner of a forest, where a time gate offers you an unpredictable escape route. You decide to take it and vanish off into the unknown. Impossible during this stage of the game since you have no access to a time gate. You can't even return from the unknown gate as the chancellor will simply corner you again. This page was last edited on 13 April 2019, at 03:50. This page has been accessed 97,397 times.